Just a quick note with regard to our recent order. We were pleased to have our parcel arrive within a few days of placing our order and that what we received was exactly what we ordered and nothing was broken or cracked, so thank you very much for your great service. Whenever my husband needs anything relating to audio, video, electrical etc, he always looks at Cable Chick first and thank you for having such a huge variety of stock as whenever we need something in relation to cables etc, we can be pretty sure Cablechick will have it. HDMI to Mini-HDMI Male & Micro-HDMI T-Shaped Adapter + FREE SHIPPING! Photographers, cameramen and gadget junkies lend me your ears! No longer will we be forced to carry multiple HDMI adapters with us to suit all our devices! No longer will we need to untangle our bag of HDMI cables in front of busy clients! We have the solution, and the solution is T-Shaped! This adaptor is simple and clever. It offers a Female regular HDMI socket (Type-A), which connect to both a Male Mini-HDMI (Type-C) and Micro-HDMI (Type-D) plug. All you need to do is connect the Mini or Micro connectors to your device, and plug a regular HDMI cable into the Female socket and you're away! 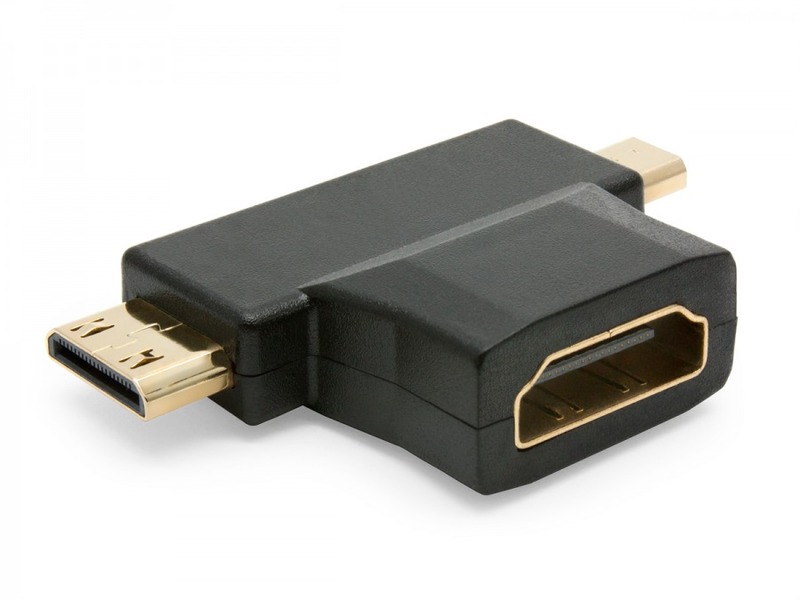 This super handy and compact HDMI adapter allows you to plug into both Type-C MINI HDMI devices and Type D MICRO HDMI devices (one at a time of course) and get a regular TYPE A HDMI output for use with any regular HDMI cable. This means you'll only need one adapter and one cable for use with all your tablets, ultrabooks, cameras, and media players that support the small-scale HDMI sockets. The only trick is that some devices (particularly cameras and camcorders) sometimes have recessed HDMI ports that this T-Shaped adapter won't offer enough clearance for. 5mm up is all you get from either male plug to the start of the female socket, and the female socket juts out another 13.5mm. The total size of the adapter is only 45mm (W) x 26.5mm (H) x 10.5mm (D). Tiny! Thanks for the great products and the I was very impressed with the timing (next day on my door step), keep up the great work.